Within the last 24 hours I’ve learned of two active participants in the cocktail blogosphere who are now, um, on unscheduled sabbatical as a result of the global economic crap-tsunami (and that’s not counting the geniuses like me who thought it wise to quit a job just before the financial sector went into a tailspin). But hey, it’s Mixology Monday, and that’s always good for celebratin’, right? Unless the theme is Hard Drinks for Hard Times, as suggested by host Matthew Rowley, one of those who has EXTRA time on his hands nowadays — then, it’s one more reminder that it’s time to slowly freak out as you check your bank balance and your work calendar, both of which are looking pretty grim. The point here is not simply to stint your guests on quality and quantity — any fool can pre-pour Moroccan red into burgundy bottles, or behave as if all knowledge of the existence of drink has been suddently excised from his brain at 10pm — but to screw them while seeming, at any rate to their wives, to have done them rather well. This is cheapskatery in its most creative form — transforming the host’s mission of generosity into an insolent penny-pinching endeavor in a way that makes it seem, at least to some of the assembled, that you’ve raided your liquor cabinet for nothing but the finest of spirits. Vital requirement: prepare pre- and post-dinner drinks in some undiscoverable pantry or broom-cupboard well away from the main scene. This will not only screen your niggardliness; it will also make the fetching of each successive round look like a slight burden, and will cast an unfavorable limelight on any individual determined to wrest additional drinks out of you. Sit in a specially deep easy-chair, and practise getting out of it with a mild effort and, later in the evening, a just-audible groan, though beware of overdoing this. Procedures vary. 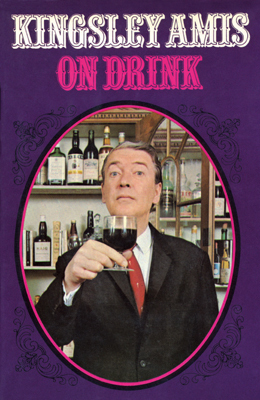 The obvious one is to offer only one sort of drink, a ‘cup’ or ‘punch’ made of cheap red wine, soda water, a glass of cooking sherry if you can plunge that far, and a lot of fresh fruit to give an illusion of lavishness. Say you invented it, and add menacingly that it has more of a kick than might be expected. Serve in small glasses. […] offer brandy, explaining a good deal less than half apologetically that you have no cognac, only a ‘rather exceptional’ armagnac. This, of course, produced with due slowness from your pantry, is a watered-down cooking brandy from remote parts of France or South Africa. […] Ask the ladies if they would care to try a glass of Strelsauvada, a ‘rather obscure’ Ruritanian liqueur made from rotten figs with almond-skin flavouring which admittedly can ‘play you up’ if you are not used to it. They will all say no and think highly of you for the offer. 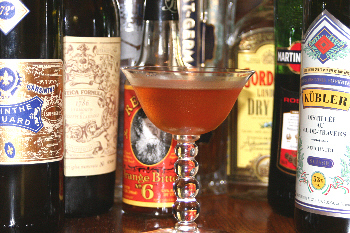 In both cases you have a similar combo;but while in the former you’re accenting the rich botanicals of the Blue Gin and Carpano Antica with the cascading vegetal flavors of a good absinthe and enlivening the mix with elderflower liqueur, in the latter you’re using that same liqueur, as well as a more flat anise note from the Kubler absinthe, to pull the flavors up from the not-quite-as-exciting mix of Gordon’s and mainstream vermouth. Less vavoom than the former, of course, but still, not bad. Times are tough; sometimes a little pampering is required, and $4.69 for a decent homemade cocktail is a bargain compared to an afternoon at the spa or a weekend trip to Vegas. Now head on over to Rowley’s Whiskey Forge and see what the other miscreants have been up to this MxMo. ← Torch? Check. Pitchfork? Check. Brilliant! Reading the Amis compilation “Everyday Drinking”, which included your aforementioned essay, was one of my reading highlights of 2008. And I love your substitutions in the Cheapskate/Unwelcome Houseguest. Is it a sign that I’m on the verge of being Amis-esque that I also stock everything you list? How witty! Coming up with creative ways to stiff your guests sounds much more entertaining (and probably more palatable) than growing a SCOBY on your homemade cider hooch. I’ve started reading my way through Amis’ book (unfortunately, I too have more time on my hands these days…) and great to see your take on his concepts! To make the Unwelcomed Houseguest even cheaper, using pastis at half the price of absinthe is the way to go (actually I usually go that way because I have some tasty pastises in my collection that I prefer using). That would take it down to around $1.60! I was really looking forward to that pruno post, too. But this just leaves a much better taste in one’s mouth. It’s a joy to read your prose. Hah! Great post, Paul. My only problem is that I hang out with cocktail nerds who can tell the difference between absinthes and vermouths. Fortunately, the friends I have who are not nerds are perfectly happy with a case of Pabst and a 750 of Christian Brothers.